. We realized that for many searches, the best answer wasn’t text—it was an image or a set of images. The service has grown quite a bit since then. In 2001, we indexed around 250 million images. By 2005, we had indexed over 1 billion. And today, we have an index of over 10 billion images. It’s not just about quantity, though. Over the past decade we’ve been baking deep computer science into Google Images to make it even faster and easier for you to find precisely the right images. We not only find images for pretty much anything you type in; we can also instantly pull out images of clip art, line drawings, faces and even colors. There’s even more sophisticated computer vision technology powering our “Similar images” tool. For example, did you know there are nine subspecies of leopards, each with a distinct pattern of spots? Google Images can recognize the difference, returning just leopards of a particular subspecies. It can tell you the name of the subspecies in a particular image—even if that image isn’t labeled—because other similar leopard images on the web are labeled with that subspecies’s name. And our “Similar colors” refinement doesn’t just return images based on the overall color of an image. If it did, lots of images would simply be classified as “white.” If you’re looking for [tulips] and you refine results to “white,” you really want images in which the tulips themselves are white—not the surrounding image. It takes some heavy-duty algorithmic wizardry and processing power for a search engine to understand what the items of interest are in all the images out there. 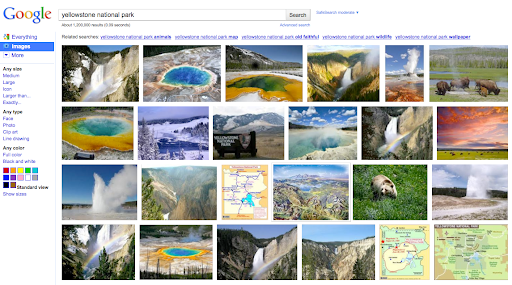 Those are just a few of the technologies we’ve built to make Google Images more useful. Meanwhile, the quantity and variety of images on the web has ballooned since 2001, and images have become one of the most popular types of content people search for. So over the next few days we’re rolling out an update to Google Images to match the scope and beauty of this fast-growing visual web, and to bring to the surface some of the powerful technology behind Images. And for our advertisers, we’re launching a new ad format called Image Search Ads. These ads appear only on Google Images, and they let you include a thumbnail image alongside your lines of text. Check out our Help Center for more info on how try them out; we hope they’re a useful way to reach folks who are specifically looking for images. These upgrades are rolling out in most of our local interfaces worldwide over the next few days. We hope they not only make it easier to search for images, but also contribute to a better aesthetic experience. We see images as a major source of inspiration, a way of connecting the world—and their growth is showing no signs of slowing down. We’ll work to make sure Google Images continues to evolve to keep up. When you think about “information,” what probably comes to mind are streams of words and numbers. Google’s pretty good at organizing these types of information, but consider all the things you can’t express with words: what does it look like in the middle of a sandstorm? What are some great examples of Art Nouveau architecture? Should I consider wedding cupcakes instead of a traditional cake? This is why we built Google Images in 2001. We realized that for many searches, the best answer wasn’t text—it was an image or a set of images. The service has grown quite a bit since then. In 2001, we indexed around 250 million images. By 2005, we had indexed over 1 billion. And today, we have an index of over 10 billion images.